I’ve caved to temptation and streamed the new record while writing the first drafts of these questions and waiting for the CD to arrive. “Where I belong” was the first song that made me fully stop to take note. At this point in the record, you instinctively know that it is going to get even better as the album finishes out. The heartfelt melancholic beauty of ‘This Old Table’ is eyes wateringly good. It was great that you released the digital EP with the alternate piano version. Are you sitting on any other versions that might be released in the future? I’ve developed an aversion to the digital music format. While waiting, I decided to get a physical copy of the first record the ‘Ship and the Iceberg’. I feel bad because I bought a used copy as I didn’t realize they were still available from you directly. Did you make more or am I wrong in thinking they had originally sold out? How is it working with Olive Grove this time out? I’ve been noting the favourable press whirlwind. There seems to be a great deal more of it than the last time. The one glaring exception coming from the Herald Scotland provoked a bit of twitter research on my part. It seems that their “arts correspondent” doesn’t really have much involvement in the musical arts. I’d love to dismissively browse his record collection and scoff at the twaddle I’d expect to find there. What has your reaction been to the press this time around? My suspicion is that they have caught up with you. Referencing the “folkish undertones” from your press clippings page, I want to specifically ask how much musical inspiration (or background) stems from traditional Scottish folk music. Truthfully, I’ve never really been a big fan of folk music itself. Pedro lent me a vinyl copy of ‘Whaur the Pig Gaed on the Spree’ (Alan Lomax recordings 1951-57). This led directly to my purchasing Alasdair Roberts ‘Too Long in This Condition’. While my musical sensibilities are still firmly mired in indie pop/folk as opposed to more traditional treatments, it is something I could see myself exploring more deeply. I’ve also just recently ‘discovered’ Randolph’s Leap and noticed the brass instrument overlap between your bands. They are another example of a band I might not have paid much attention to a year ago; not somber, loud, dark or melancholic enough for my old tastes. I don’t remember listening to and enjoying a record as much in quite a while. Are there any other projects the State Broadcasters have been in involved with? Any future collaborations to look forward to? ‘Ghosts We Must Carry’ – What are some of these ghosts? For myself, they are almost innumerable, but certain ghosts loom larger than others and the task of coming to terms (or not) with them does not necessarily get easier with time. This has very much been translated into the music itself and I can’t help but feel that some bitter experiences went into the making. Is there a specific origin for the title? Thinking of the album’s title still, Cloud Cult’s “Feel Good Ghosts” immediately comes to mind. Have you heard it? If not, I’d love to hear your reaction. In a way, that album seems to counsel on how to celebrate the ghosts rather than letting them haunt you. I’ve just read that the Trespassers Video is going to be ready and released in October. I originally only ordered the signed CD when you were raising funds for it. Visiting the site a few months later, I noticed that the 19th moth had just been pledged. Only one left – I had to get it. It is a lovely idea that was nicely executed. Were the moth models used in the video or were they purely a fund raising creation? I’ve just embarked on what I’m calling the mp3 reclamation project. I’ve got a good deal of Scottish music in digital form only. I’ve even obtained those silly vinyl cdrs to do it. My first recovery is Viva Stereo’s ‘Endure the Dark to See the Stars”. Does anyone happen to have this in their collection? How eclectic are the musical tastes of the band members? “If you endure the dark, in time, you’ll see the stars” a recurring lyric on this Viva Stereo record playing at the moment. What are some of your favourite lyric snippets? From over here, on the west coast of another continent, it seems that Scottish music is becoming more sharply defined and may well be poised to embark on an invasion of its own. Of course, that may be my own wishful thinking. Is there any sense, over there, that musically things have, like the new Meursault record for example, risen to a whole new level? What are the plans for the Broadcasters going forward? Have you considered releasing a nice ten inch vinyl single for ‘This Old Table’? You know the original, the one from the EP, that new version you are holding on to and a nice JC remix. The Video: My moth at o.o9! I bristle at the idea of writing a review, so I’ll just frame it as one person’s thoughts and opinions. Other than the fact that it is in my collection and it should be in yours, what is there to recommend about ‘Ghosts We Must Carry’? While waiting for the sophomore release, I ordered a physical CD of ‘The Ship and the Iceberg’. Having read a few reviews from the first, I was struck by how numerous, consistent and effusive the ‘press’ was for the new record. It did not strike me as excessive, because the album is that good, but oddly delayed. In my mind the first record was equally good. Where was all the praise for it? ‘Ivor Cutler Suggests We Join the Noise Abatement Society’ starts off the first record with some piano and a giggle. Not quite Divine Comedy’s ‘Something For the Weekend’, but by the time the song rolls into the orchestral pop of ‘Let’s Make T-shirts’ it becomes clear that this melancholy tinged record still balances out with a nod toward optimism. After comparing the two, you quickly realize what an artistic leap forward it is. ‘The Only Way Home’ starts things off with considerable more static and from the outset melancholy has transformed itself into lament. Cold news delivered by phone. Lyrically that is about all we learn. Musically the differences between the openings of the two records are pronounced. Already darker from the outset, the addition of effect drenched guitars after the solemn brass and strings underscores just how much this record seeks to explore new territory. 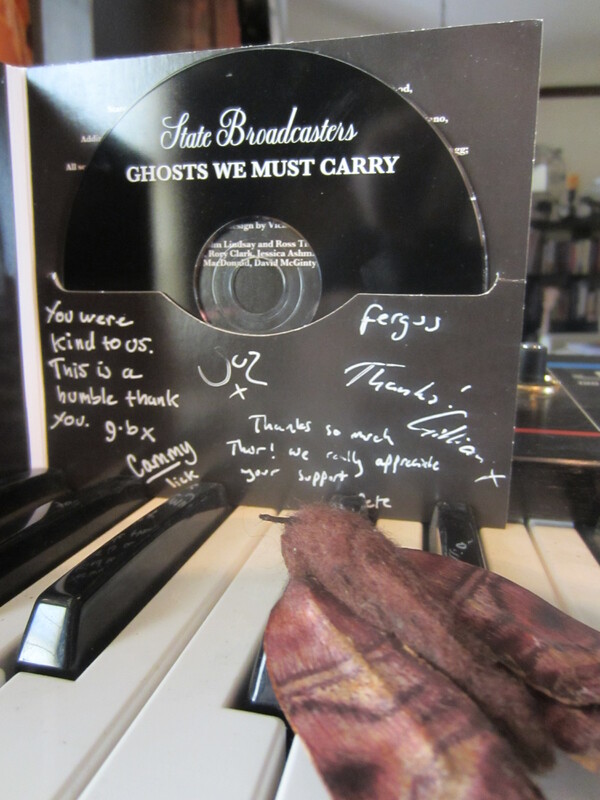 The title and the main ideas behind ‘Ghosts We Must Carry’ are obviously universal. Each of us can infuse them on a personal level beyond the actual lyrics adding even more emotional depth to the music. I’m listening to it for the second time properly (off the CD on the stereo). I’m wiping away the tears, because at the same time I’m reading a two year history of tweets from an account that is normally locked to me. Thank goodness for technological glitches. It is a window that has allowed me to effectively ‘trespass’ for the short time it remains open. Like my own, the tweets are overwhelming about music. The author blogs about her love of Canadian indie music; rather a wise choice considering she is based in Toronto. I discovered her blog a few months after starting my own. I often think that things musical are how providence, fate or karma manifests itself in my life. At first, I thought it was a good thing and might somehow bring about desired change. Of course, I was wrong. My “estranged” daughter still seems lost to me and the promises that this is how it would unfold by my ex-wife remain fulfilled. It was just the universe toying with me. I state this because I’ve nowhere else to state it. My desire to have a conversation with the one person I desperately need to speak to the most has evolved into a conversation that I have with myself. Like Kittiwake (playing now) ‘I need things to change. Instead of being devastated this window has given me hope – like the melody of the song itself. “This is a painful way for you to say you’ll get by”. My ghosts are, of course, unique. However, anyone who has ever experienced loss of any kind will easily see the outlines of their own ghosts in the album. Herein lies the true beauty of this record. The tales and the songs about them seem completely genuine reflections of whatever ghosts they seek to address. By the time ‘This Old Table’ comes along it culminates in the most emotionally honest song I’ve heard in a long time. It would be possible to weave all the songs together as one larger narrative piece and perhaps this is as intended. Even if I’m overreaching in thinking that, there is a cohesion here that works better than any concept album ever could. It is done with sincerity, candor and grace. For the Broadcasters the closing track ‘New Year’s Day’ is short, wistful and obviously meaningful. In my mind, narratively, it is the voice of the person who has experienced the profound loss reflecting back at the cusp of the future. The ghosts need to be carried forward. Their burden never fades. There are much better reviews out there. I read it quickly when it was first posted and then deliberately avoided going back. It is the review I wish I could have written. For the most part, the reviews are remarkably consistent because the album itself is that remarkable. This entry was posted in Bands We've Chatted With and tagged Ghosts We Must Carry, State Broadcasters.